The Koch Brothers Oppose The Travel Ban. So Does My Daughter Emily. So Does The CATO Institute. And, By Golly, So Do I. The conservative movement's financial and spiritual doyennes, the Koch Brothers, have unequivocally condemned President Trump's travel ban. They call it "the wrong approach" and said via their network, "we believe it is possible to keep Americans safe without excluding people who wish to come here and contribute and pursue a better life for their families. The travel ban is the wrong approach and will likely be counterproductive. Our country has benefitted tremendously from a history of welcoming people from all cultures and backgrounds. This is the hallmark of free and open societies." Meantime, my daughter Emily in a public posting on facebook applies some of the analytical thinking she sharpened during her studies at UC Berkeley along with several years as an exec in a rapidly growing hi-tech company based in San Francisco. Says Emily: "I want to go on the record as stating, DT's xenophobic policies will do nothing but make terrorism *worse. * Why? Imagine the young, uneducated folks struggling under oppressive governments being courted by extreme Islamic ideology and without access to the media. This news will quickly make it's way to IS anti-US propaganda and will enflame the passions of those considering a path to extremism. To fight terrorism, the West should embrace and ally with the moderate Muslim majority around the world; remember that the most gruesome and frequent terrorism incidents happen in Muslim countries (though these rarely make the news with the same gusto as attacks in the West) and moderate Islam is equally if not more motivated and incented to put an end to this viciousness. By preventing the free flow of people (and thus thought) from repressive regimes into the relatively stable West, we alienate the Muslim majority allies that we need critically to end terrorism. And finally, if we can accept that a human life is a life is a life, and the death of a Syrian is equally tragic to the death of an America, this policy will kill far more people than the infinitesimally small risk of letting in a terrorist posing as a refugee. I get it - terrorism is, well, terrible but it's still a statistically nonexistent as a risk to any one person. The immediate loss of life and increased suffering this new policy far overshadows in net human cost." I strongly oppose Trump's ban, myself, but I have to say that when the Koch Brothers and my daughter Emily are on the same side of an issue, something tectonic is going on. Joining Emily and the Koch Brothers are the conservative thinkers at the CATO institute, who, besides condemning the ban itself, question the choice of countries selected by Trump, noting that "the countries that Trump chose to temporarily ban are not serious terrorism risks." CATO says that between 1975 and 2015, no Americans were killed here by people from those countries, which produced a total of 17 individuals who were arrested and convicted of carrying out or attempting to carry out a terrorist attack here. During that period more than 3,000 Americans were killed here by terrorists coming from countries (Saudi Arabia, United Arab Emirates, Lebanon, Egypt and a handful of others, mainly Muslim by population) that are not on Trump's exclusion list. Concludes CATO: "These policies will not improve national security and will undermine America’s efforts to combat Islamic extremism and terrorism around the world." Trump's hasty and poorly thought out immigration plan has been mercifully put on hold by a federal judge, but the methodology reeks of incompetence just the same. laughingstock out of our GOP's historic commitment to letting people run their own lives and institutions on a local level. That particularly sacrosanct principle applies to education. The 2016 GOP national platform specifically says that as Republicans, "we reject a one-size-fits-all approach to education and support a broad range of choices for parents and children at the state and local level." Get that, South Dakota Republican legislators? The GOP supports a broad range of choices. Taking choices away from our local school districts and the boards that run them is the stuff of a party that wants to hypocritically insert itself into people's local affairs. A couple of irritating examples of this come quickly to mind. The first is Senate Bill 55, which will require schools in the state to let teachers teach anything they deem "scientific" to their students in an "objective scientific manner." The unlimited potential for academic mayhem inherent to the nebulous language of this bill (you could make a case for witchcraft being taught as science, for example) is one thing, but that the bill brings the heavy-handed mandate of the state into classroom content decisions goes against every principle of local control that Republicans cherish. Why have school boards when the powers in Pierre want to impose decisions like this? Senate Bill 89, lumps our schools in with every "public entity" in the state, and would make schools liable for civil damages if "a person who is unable to carry a firearm due to prohibition" on their premises were injured by a crime of violence. 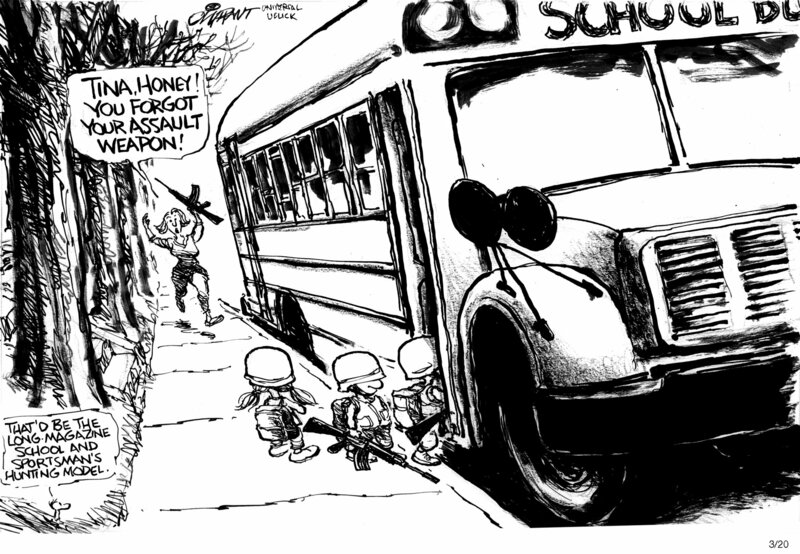 If this bill passes, your local school board would be pressured by the state into making a decision about allowing teachers, staff, students, visitors, everybody, to carry firearms on campus. Given the craziness that's been abounding on campuses all over the country in recent years, this is a decision that merits some consideration, my personal feelings notwithstanding. School boards should indeed be thinking about this--but they should be making the decision without the burden of civil liability law imposed on them by the State of South Dakota. If the state wants to make the law apply to state-owned facilities, fine. But our local public schools? No way this Republican can accept that kind of coercion from the State of South Dakota, where GOP dominators have abandoned the self-limiting principles that used to define their party. Manning The Barricades In Pierre: South Dakota Government Is Revolting Against The People. law was Initiated Measure 22, which contained a package of campaign and governing reforms deemed unacceptable by those who are most affected by it--elected officials in the State of South Dakota. The law imposes strict limits on lobbying, creates an independent ethics commission and provides for public financing of campaigns. That last point made me vote against the Initiative, but the rest of it is just fine with me, along with a whole passel of South Dakota voters who were satisfied enough with all the elements of the measure to approve the Initiative by a 53% majority. Supporters are justifiably fed up with South Dakota government's lax oversight of its operations. That laxity was embarrassingly and expensively exposed in the past few years by scandals (EB-5, Gear Up) that resulted in suicide, murder and the loss of millions of dollars of public money. 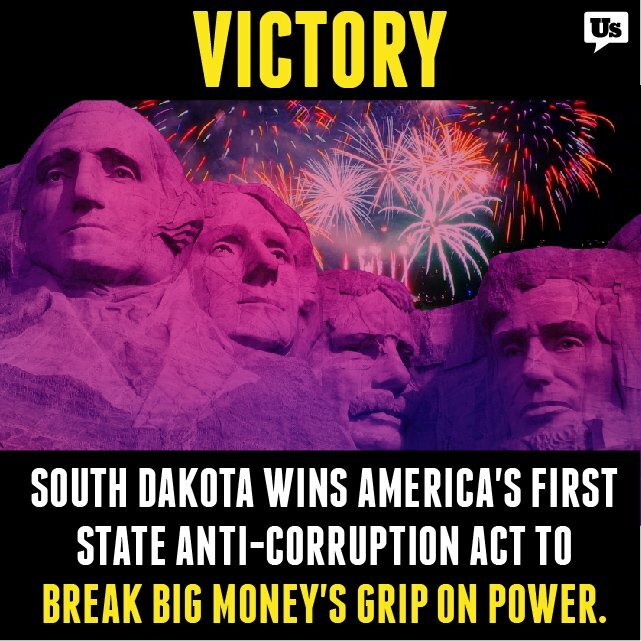 It's little wonder that South Dakota government gets an "F" from the Center For Public Integrity, which places us 47th worst in the country in the corruption sweepstakes. IM 22 is swamp drainage, South Dakota-style. Considering that IM 22 has already been deemed unconstitutional in its first court test, mainly in anticipation of a final judgement at the state supreme court, I'd say the odds favor the whole thing being thrown out. If so, a more constitutionally-conforming version will probably surface. Considering the legislative panic this thing has already provoked, unsympathetic voters ready for reform will likely approve a revised version in even greater numbers. 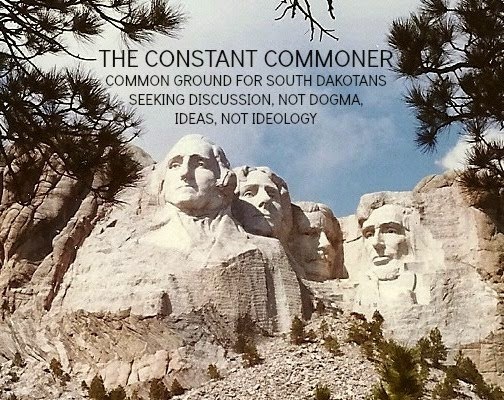 In their cavalier presumption that they know what's best for South Dakotans despite a voter mandate that says otherwise, our stubborn political class can't grasp that the public is ready for some serious change. "Net Neutrality," The Election, John Thune . . . And Your Internet Service. rule is enforced by the Federal Communications Commission, but I believe it is now jeopardized, generally, by the election of Donald Trump, and specifically, by the fact that our U.S. Senator John Thune has been a vigorous opponent of the concept for years. When the FCC voted 3-2 in 2015 to regulate the internet--a ruling upheld last year by a federal court--Thune was incensed, calling it "partisan . . . a power grab . . . and federal overreach." Thune's reaction reflected the general attitude among ISPs, who would probably love to develop their services into multi-tiered offerings of speed and quality, giving customers levels of service that vary with prices. A.T.& T. and Verizon last month were tangling in an issue over the subject with the FCC and will likely be most supportive of taking net neutrality out of the communications lexicon as soon as the Trump administration starts staffing it with friendly commissioners. Of some note, A.T.&T. and Verizon are two of the top 5 contributors to Thune's campaign committee and leadership PAC during the period 2011-2016. South Dakotans who are used to unlimited internet accessibility to all sites and apps with the same speed applied to each of them should be aware of this likely change. The incoming Republican majority at the FCC can immediately hit the "undo" button and reverse course on net neutrality simply by refusing to enforce the rule. As it stands now, ISPs are banned from blocking or slowing legal internet sites and apps or generally using their connectivity to favor some sites over others. The problem for consumers will come when the service providers begin showing some form of favoritism toward content that they might happen to own. Speedier access to premium sites is a possibility. Repeal Obamacare? We South Dakotans Need To Look Before Leaping. Obamacare? Grrrrr . . .
Obamacare, which Senator Rounds called a "sinking ship" last week, our federal reps, including Senator Thune and Congresswoman Noem, seem utterly clueless about how to proceed. For one thing, Rounds has already referred to a "gradual transition" toward a replacement, which means he's bereft of ideas on what to do next. Meantime, Congresswoman Noem says she wants to "retain safeguards for pre-existing conditions and allowing kids to stay on their parents' plans." Telling the Rapid City Journal last month that "we need to give people more choices, not more mandates," Noem doesn't understand the linkage between ACA's individual mandates and insuring for pre-existing conditions. We can't "choose" our way around that reality. Senator Thune hasn't said much on the subject of replacement, though he's voted to end Obamacare numerous times over the years, no substitute in sight. ACA rate increases were still in force. 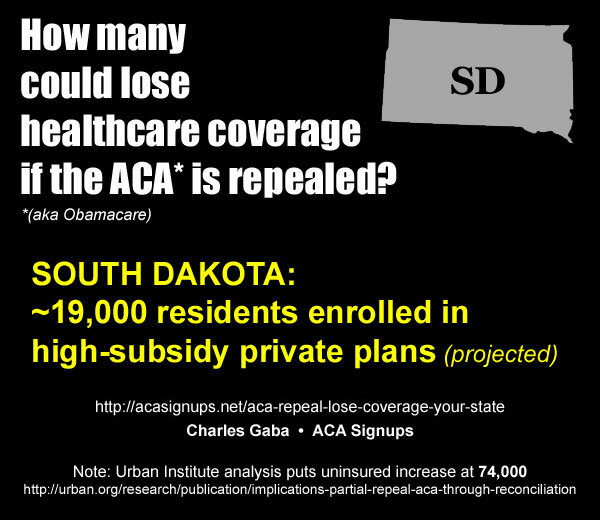 There doesn't seem to be much doubt that ACA has had some significant statewide benefits for South Dakotans, a fact that suddenly seems to be dawning on our Republican U.S. reps and their partisan colleagues in Congress. It's looking more and more like a slower-motion process will turn the chest-thumping and reckless rhetoric about immediately repealing Obamacare into the deliberative process that it needs to be. I admire that Pubs want to keep the best of ACA but am dubious about how they can do that by repudiating a system that most Americans (75%) either want left intact or abandoned only if a suitable replacement is found. Noem Likes The Congressional Ethics Commission. Will She Push For One In South Dakota's Legislature? in the U.S. House of Representatives, having been there since her election in 2010. Despite a nondescript tenure, characterized mostly by going along with the political winds wafted by national Republican leadership, she's probably positioning herself as somebody with a track record that she can run on when the '18 campaign for governor gets underway a year from now. I think she made a pretty decent start in Washington yesterday at the opening of this Congressional term by voting against an obnoxiously transparent effort by the majority of her Republican peers in the House of Representatives to gut the Office of Congressional Ethics. 119 House Republicans proposed to put the office under House control, essentially destroying its independence, a move that was so blatantly self-serving that even President-elect Trump used his bully Twitter account to scold Pubs and remind them that they had more important legislation to consider. Having smacked the collective tone-deafness out of the GOP reps who promoted this thing, Trump got them to abandon the effort, post-haste. Coming out of the fiasco in squeaky-clean fashion, Noem was one of 73 Republicans who voted against the move, for reasons that can coalesce into one conclusion: She's okay with the idea of an independent ethics commission overseeing an elected legislative body. If I'm wrong and there was some other political or personal motive, I'm eminently correctable--and I invite explanation of Noem's vote by her office here in the blog's comment section. Until then I take the existential position that Noem supports independent ethical oversight in Congress, not a particularly bold conclusion and one that dovetails with the idea of an ethics commission for South Dakota government. them they were "misled" into voting for the initiative. As expected, the measure was taken to court, where it was struck down as unconstitutional. That outcome notwithstanding, I have no doubt that the section of IM 22 establishing a D.C.-style independent ethics commission for South Dakota's legislature--indeed, all branches--would pass constitutional muster. And now that Kristi Noem has staked out her position in favor of such a body in the U.S. Congress, I expect her to make the creation of such a commission a key part of her proposals during the coming gubernatorial campaign. After all, her prospective constituents have already voted for one--and if it's good enough for South Dakotans and it's good enough for the U.S. Congress, why wouldn't it be good enough for South Dakota government? What say you, Representative Noem?